Wednesday Political Mix: Obama's 'Read My Lips' ACA Problem : It's All Politics Republicans increasingly attack the Affordable Care Act for violating President Obama's vow that people could keep health plans they liked... As congressional budget talks start, the White House seems focused more on reducing sequester cuts than getting new revenue... Is there an Obamacare goldmine? 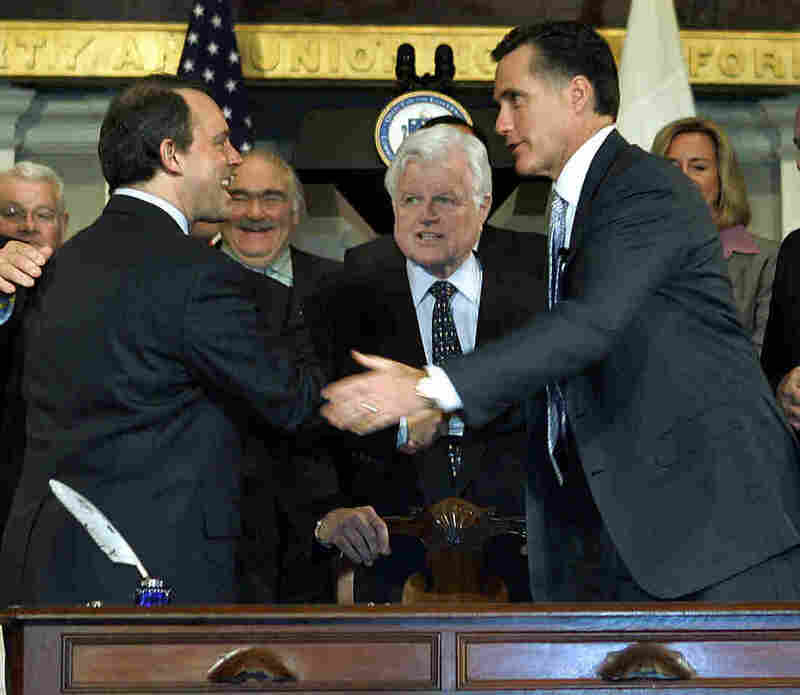 President Obama would like you to remember that Obamacare was based on Massachusetts legislation signed in 2006 by then governor and Republican Mitt Romney, pictured at the signing ceremony. And that rollout started slowly, too. The Affordable Care Act should dominate Wednesday's news cycle thanks to scheduled high-profile appearances by President Obama and Health and Human Services Secretary Kathleen Sebelius to defend the law. President Obama plans to be in Faneuil Hall in Boston later Wednesday. His appearance is meant as a blaring reminder that Obamacare's roots were in Massachusetts and Republican. It was in that very hall that Mitt Romney, Obama's 2012 GOP rival for the presidency, as governor signed into law the health-care insurance legislation that became model for the national law. Meanwhile, Sebelius will testify before the House Energy and Commerce Committee where she will be grilled by Republicans about the infamously rocky launch of the federal health exchange website. Republicans have also begun hammering the Obama administration about the insurance cancellation letters many people are getting from their old insurers forced to end certain policies under the new law. With that, here are some interesting items of political news or analysis that caught my eye this morning. Obamacare's critics are increasingly seizing on a very real problem the president created for himself. Before the law's 2010 passage and after, the president reassured Americans that if they liked their health care plans and doctors, they could keep them. But that's not true in many cases. The Washington Post's Lena H. Sun and Sandhya Somashekhar capture the situation. It's a "read my lips" problem for the president. Like President George H.W. Bush, he made a high-profile promise that is being violated. Meanwhile, WaPo's Sarah Kliff recently explained in detail the reasons for the cancellations. School districts and local governments in Pennsylvania, Delaware and New Jersey (and presumably elsewhere) are reducing the hours of part-time workers to avoid having to provide them with health insurance under Obamacare, reports the Philadelphia Inquirer's Kelly April Tyrrell. Republicans have portrayed Obamacare as a huge threat to the U.S. economy that will beggar many Americans. But some investors spot a potential goldmine, writes Adam Davidson of NPR'sPlanet Money in The New York Times Magazine. As talks begin Wednesday between congressional budget negotiators, there were indications the White House might not insist a deal include new tax revenues in exchange for removing part of the sequester cuts, The Wall Street Journal's Damian Paletta and Janet Hook report. National Journal gives ammunition to both sides of the argument about the ultimate meaning of a defeat Republican Ken Cuccinelli next week in Virginia's governor's race. Sarah Mimms writes that if he loses, which some polls suggest is likely, it will be a one-off event due more to his particular failings as a candidate. Josh Kraushaar, on the other hand, writes that Cuccinelli's failure could signal a larger GOP crackup since the Tea Party forces behind his nomination may not draw the right lesson. Little about the unraveling of former congressman Jesse Jackson Jr.'s life and career has been predictable. That now includes the way he surrendered himself to federal prison authorities in North Carolina. The Chicago Tribune's Katherine Skiba reports Jackson caused initial confusion that resulted in his being turned away by prison officials by showing up at prison several days too soon but that he's now begun serving his sentence for his federal conviction.